Located just some two hours away from Munich by car or train, it is worth a side trip as the journey down to southwest Bavaria has some majestic and spectacular views of the German and Austrian Alps. And not to worry, as there’s no enchanted spinning wheel awaiting you at the castle to prick your finger and lull you to a deep sleep that would last for an eternity. What’s waiting are the many mom-and-pop diners along the way, so be sure to stop and sample real Bavarian cuisine at these little gems. Enjoyed the story? Please like FoodTrips.ca on Facebook, and Follow us on Twitter and Find us on Pinterest! 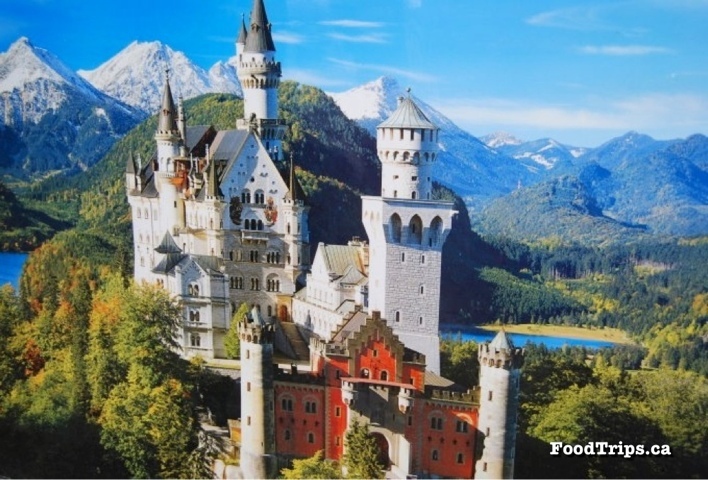 This entry was posted in Europe, Food, Germany, Travel, Where in the world is this? and tagged Bavaria, Cinderella Castle, Disneyland, Hong Kong Disneyland, Ludwig II of Bavaria, Munich, Neuschwanstein Castle, Sleeping Beauty Castle, travel. Bookmark the permalink. wow, great piece of trivia, as always! Thanks, Sandra! You should see this place when you get the chance! You’re the best writer!! Im so proud of you! !